The SLS E-Cell can reach 526 h.
Mercedes-Benz is set to launch a wave of small luxury vehicles in the United States. An all-new C-class coupe will debut next year, followed by three derivatives of the front-wheel-drive B class in 2012 and 2013. "Everyone wants to be Mercedes-Benz," said Ernst Lieb, CEO of Mercedes-Benz USA. Now, Lieb said, Mercedes will enter segments where competitors are strong. Here is a rundown of Mercedes' product plans. B class: Coupe, crossover and sedan versions of the next-generation B class come to the United States in 2012-13. They'll be the first fwd cars sold by Mercedes in North America. Styling is said to make them more viable for the United States than the boxy, first-generation B class sold in Europe. Spy shots show a design similar to the BlueZero concept car unveiled at the 2009 Detroit auto show. The vehicles may not all be given the B-class name, Lieb said. The B-class range is expected to have four-cylinder engines, which are currently not available in any Mercedes product sold in the United States. A partnership with Renault-Nissan will develop new three- and four-cylinder engines with turbos and gasoline direct injection for this new generation of vehicles. F cell: An electric fuel cell version of the current B class sold in Europe will start sales in the United States in the fourth quarter. At first, the F cell will be tested through a leasing program in California because of the availability of recharging stations in the state. All together, Mercedes has said it will test 100 of the 240-mile (386km)-range electric vehicles in the United States. C class: The sedan gets a mild freshening this year, and an all-new coupe based on the current-generation sedan goes on sale next year. The C class will be redesigned in 2013 and get more derivatives, including a convertible and possibly a crossover. The new generation also will get a new family of four-cylinder engines. The next generation will be built in Tuscaloosa, Alabama. E class: A redesigned E-class Cabriolet and station wagon went on sale this year, joining the new-generation sedan and coupe. The range won't get a freshening until 2013. CL: The CL is slated for a redesign in 2013, when Mercedes probably will change the name to the S-class coupe. Meanwhile, the large coupe gets a midlife freshening in November with new headlights, changes to the hood and mirrors and updated taillamps. The CL500 version gets a new twin-turbocharged, 4.6-liter V-8 direct-injection gasoline engine with 429 hp. The CL600 carries over its 5.5-liter V-12 with 510 hp. The high-performance CL63 AMG gets a more powerful engine: a 5.5-liter, twin-turbocharged V-8 with 536 hp. The CL65 keeps its 621-hp, 6.0-liter V-12. CLS: The restyled and re-engineered second generation of the four-door, coupelike sedan debuts at the Paris show in September and goes on sale in the United States in 2011. S class: The S63 version with a new 5.5-liter biturbo engine goes on sale in November. The S65 continues with the same engine but gets a bump in power to 621 hp. The S350 diesel debuts in the first quarter of next year. A redesigned S class will be sold in the United States in 2013. The lineup will include a full hybrid. SLK: A redesigned SLK hard-top convertible is expected next year. SL: Mercedes' largest roadster will be redesigned next year. 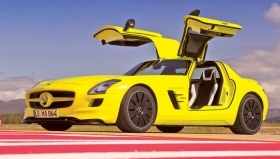 SLS AMG: The $185,750 SLS gull-wing AMG went on sale in mid-May. The super sports car has a lightweight aluminum spaceframe body built by Magna Steyr in Austria. It is powered by a 563-hp, 6.3-liter V-8. A soft-top convertible goes on sale next year. The all-wheel-drive SLS E-Cell supercar has a 400-volt electric-drive system with four motors that produce a combined 526 hp. Sales may begin in 2012. The car will be able to travel more than 120 miles (190km) on a charge. R class: In July, the big crossover was reskinned in the front and received cosmetic changes in the rear to give it more of an SUV look. Mercedes isn't saying whether it will make a second-generation R class. GLK: A freshening is expected in 2012, when a diesel variant could be added. ML: A redesigned SUV goes on sale next year with a new generation of engines, including a 50-state diesel. GL: The full-sized SUV will be redesigned in 2013. G class: The iconic, military-style vehicle continues for an unspecified period with the V-8-powered G550 and the supercharged G55 AMG with 500 hp. Sprinter: A select group of Mercedes dealers began selling the commercial vehicle this year. The Sprinter is powered by a Mercedes V-6 diesel. A new Crew Van with room for five passengers and cargo goes on sale this fall. The MiniBus van that seats up to 16 people will be added in early 2011.